TUESDAY NOVEMBER 6 (Valhalla, NY) – One season ago, the Westchester Community College Men’s Basketball team had to survive the most upstart and competitive of efforts from Bergen Community College to win their final game of the regular season, and complete an incredible 2017-18 journey. On Tuesday night at Viking Gymnasium, that was not quite the case. Sophomore Monte Lambert (Brooklyn, NY/James Madison HS) broke his career-high for scoring for the third consecutive game, netting a game-high 27 points, and fellow sophomore Miles Haughton (Mamaroneck, NY/Mamaroneck HS) added 13 points as Westchester CC blasted the visiting Bulldogs, 108-62 in front of a raucous home crowd. With the win, Westchester improves to 3-0 for the 2018-19 season. 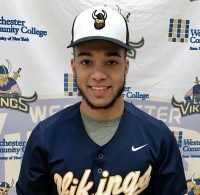 During a game when every member of the Westchester CC team scored at least one point, for a while, it did not seem like a night that would be another comfortable win for the Vikings. The two teams traded five ties and eight lead changes over the first 11 minutes, and a three-pointer by Bergen CC with 9:03 to play during the first half gave the Bulldogs a brief 25-23 lead. It was all Westchester from there as the Vikings used an 11-0 run – capped by a Jon Brennan (Irvington, NY/Iona Prep) three pointer to build a 34-25 lead with 7:11 to play. Bergen made it as close as 34-30 with 5:46 remaining, but a 15-4 Viking run made it a 49-34 game with 1:15 remaining in the opening stanza. Westchester led 51-38 at the break. The Vikings opened the second half with a 17-5 run, and coasted from there as Westchester connected for eight of their 14 three-pointers during the final 20 minutes of play. Overall, Westchester shot 47% from the floor, compared to 36% for Bergen, and the Vikings 14 three-pointers doubled the Bulldogs. Westchester CC also enjoyed a 51-34 edge on the boards, and the hosts won the turnover battle, 26-15. For Westchester, Brennan scored a season-high 12 points, while Haughton had another impressive stat-line, adding four rebounds, three assists, three steals, and two blocked shots to his 13 points. Freshman Joe Zayer (West Nyack, NY/Clarkstown South HS) scored nine points, and added seven rebounds, five assists, and two steals, while freshman Fabian Johnson (New York, NY/Our Savior Lutheran) scored six points, and added eight rebounds and five steals. SATURDAY NOVEMBER 10 (Pemberton, NJ) – Freshman Devan Lawson (Spring Valley, NY/Spring Valley HS) scored a career-high 12 points, and sophomore Miles Haughton (Mamaroneck, NY/Mamaroneck HS) added a career-best 21 points as the Westchester Community College Men’s Basketball team improved to 4-0 with a 71-56 win over Rowan College-Burlington County on Saturday afternoon at Rowan. The win was the first away victory of the season for the Vikings, one year after outscoring the Barons by 11 points at home and by four points on the road. Also for Westchester, sophomore Monte Lambert (Brooklyn, NY/James Madison HS) added 17 points.